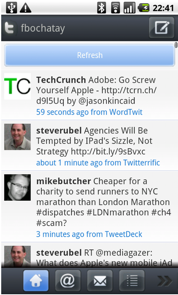 Twitter client Sobees, is working to create the best social media client on the market, competing with both TweetDeck and Seesmic. Sobees offers a native Windows client, a web-based client and is now venturing into the mobile space for the first time with a Twitter client built for Android phones. You can download the app here. Sobees’ Android app allows you to access multiple Twitter accounts, share photos and your locations, shorten URLs, read Tweets when you are offline, search recent messages using Twitter Search and see profiles, pictures, maps and more directly in the app. Sobees is also monetizing the app by adding Riotwise ads from realtime search startup OneRiot to the app. Sobees plans to add other social networks, including Facebook, and LinkedIn, in the future and is in the process of developing clients for the iPhone and Windows phone. And Sobees is readying an iPad app. The startup has also updated its desktop client, adding an RSS reader and New York Times content (integration using their API) within the client. And the desktop app will feature Riotwise ads as well. Of course, Sobees’ Android app will face competition from Twitter’s official Android App, which was announced at the microblogging network’s conference last week. It’s unclear however, if Twitter will be developing the app internally, or will be acquiring a mobile app developer, as it did with iPhone Twitter client Tweetie. Twitter could also partner with a mobile client developer like Sobees or Seesmic with the Android app, similar to the agreement Twitter has with RIM for the official Twitter app for BlackBerry phones.